Yep, there's a classifieds section where you can post an ad for just about anything. Link to it is up on the toolbar, 4 from the right. OK I shall try this again. If it fails I give up. Nice work, and very nice picture! Wow, hanging that left rear a little close? Actually I wanted to be closer, But... I need my better camera, I was impressed by how well it did come out however using my phone. Thanks for the love. IDK why the first picture wouldn't load did the same thing unfortunately I couldn't just delete the post. But i got it on there now need to get to the small mods I want to get done to her. Just picked up this '07 with 155k on the clock for just under 11k after title and taxes. 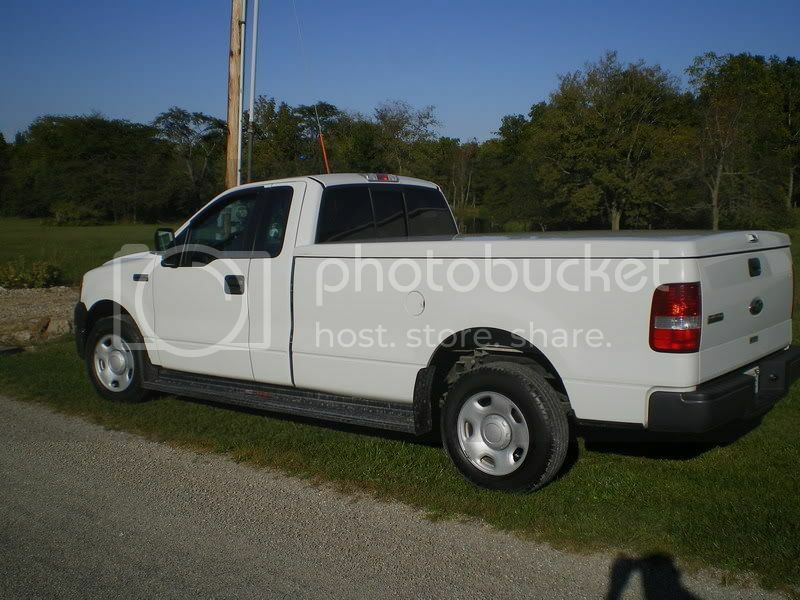 Its a XLT with keyless entry. Was looking for a 04 or 05, didn't think I would find anything newer at this price. Nice trucks! Mine is pretty plain jane, but here it is...in better days. More on that in a minute. 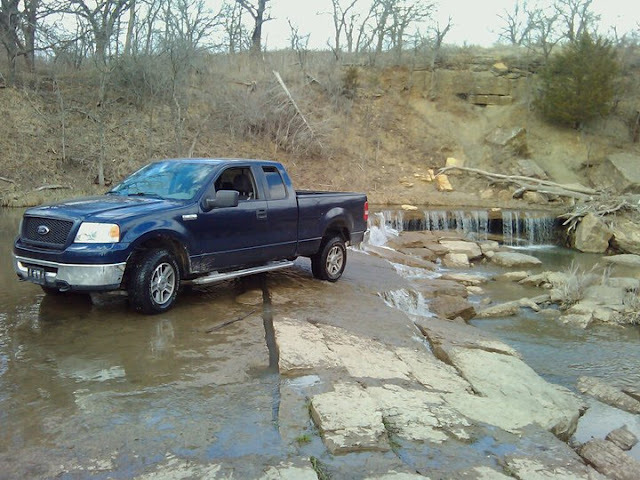 2006 F150, 8ft. bed. I bought it a couple of years ago, had 13k miles. It was kind of a "panic buy". I had gotten stuck with my wife's '97 Taurus, and the steering rack went out. Not spending one dime on a crappy car with 130k miles. Ended up getting this baby for a song. The only thing I'd change is the tonneau cover. Very impractical. Fast forward to last week. A kid driving a Grand Cherokee came flying out of an alley and almost t-boned me. The good news, nobody was hurt. 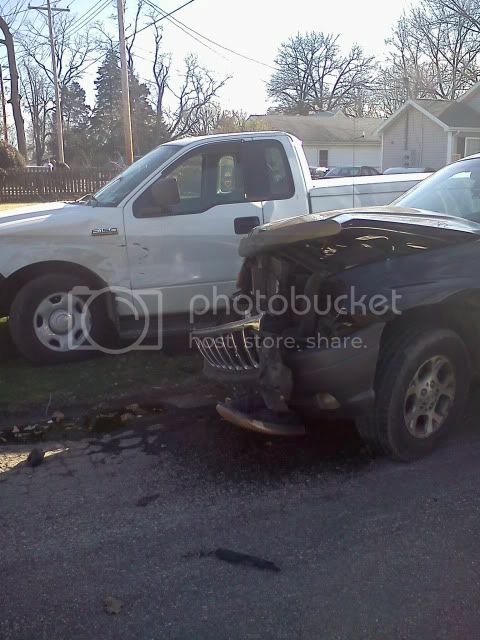 The Jeep was totaled, $4300 damage to my truck. Looking back at it, I'd say the truck is pretty damn tough. Oh I wanted to! But, kid got a ticket, his insurance is treating me right, I'll let that be good enough. I'm sure his dad is real happy. Their rates will go up! Bad thing is I'm stuck with a Hyundai Sonata as a rental car. XM radio is cool, but damn...it ain't my truck. Welcome and I would love to see a pic of this truck sounds like you have done some nice things to it.